The on-line Den Chief training is currently unavailable, so the only way to get trained is through this live class. 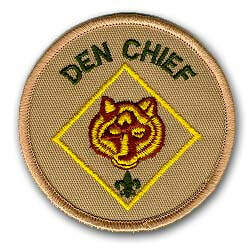 A Den Chief is an older scout* who assists a Cub Scout or Webelos Scout den leader at den meetings, pack meetings, and other events. He is the “Activities Assistant” for a Cub Scout den or Webelos Scout patrol. His role is to work with the den leaders and help the scouts complete their Cub Scout or Webelos Scout advancement requirements and live up to Cub Scouting's ideals in their everyday lives. The den chief is a member of a leadership team that includes the den leader, assistant den leader, and the denner. He is already what every Cub Scout and Webelos Scout would like to be – a Boy Scout. As far as the younger boys are concerned, he is the person they would most like to follow, and that makes the older scout a natural leader for them. * A den chief can be an older male from a Boy Scout Troop, Venture Crew or Varsity Team or an older female youth from a Venture Crew. To simplify material presentation the information in this handout refers to the den chief as specifically being a male. Den Chief Training is ON - we have enough sign-ups.